If you're a NATO member and you're attacked, other members will come to your aid. For nonmember Sweden, this doesn't apply, and so it has plans to mobilize the entire country if attacked by Russia. WASHINGTON — Roughly 220 miles of ocean separates Sweden from the heavily militarized Russian port of Kaliningrad. The country’s long, narrow shape leaves it vulnerable to air assault from multiple sides. And Sweden, along with neighboring Finland, are in the unique position as the only non-NATO aligned nations on the Baltic Sea. Now, Sweden is looking to change that. For more on Sweden’s total defense policy, including a cyber aspect, click here. A landmark commission formed in early 2017 is laying the groundwork to revitalize Sweden’s “total defense” concept, which would see the country ready to use all aspects of Swedish life to push back an invasion from an unspecified foreign adversary — but one that sounds suspiciously like Europe’s biggest bogeyman in Moscow. In an exclusive interview with Defense News during a recent visit to Washington, Defence Commission head Bjorn von Sydow and commission secretariat chief Tommy Akesson explained their vision for revitalizing Sweden’s defense infrastructure — one they believe must enable the country to hold out against military aggression for three months. 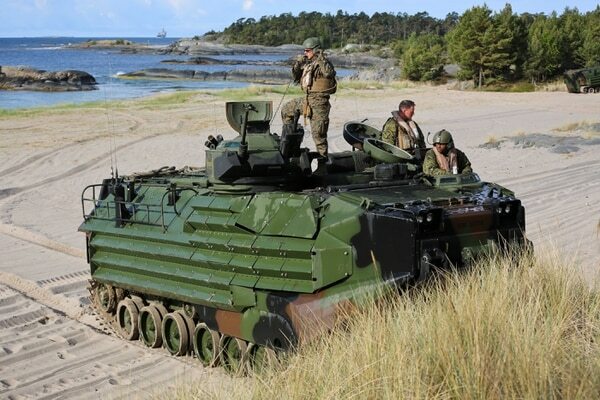 The report estimates that between 2021 and 2025, Sweden will need to invest 4.2 billion krona (U.S. $510.5 million) per year on its total defense proposals. While not a major spend by American defense levels, that is a serious investment for Sweden, especially considering it is additional money on top of what the country intends to invest in its armed forces. In the meantime, Sweden has allocated about 400 million krona per year in 2018, 2019 and 2020 to invest in total defense developments. That culminates with a major exercise, tentatively planned for the year 2020, involving all aspects of the total defense concept — in essence, a trial run incorporating the entire nation. Where do those funds go? A lot will go toward infrastructure, such as building new shelters and depots. Other funds will go toward requirements to defend the homeland. Broadly, those funds will go to “rescue service and home protection, health-care system and pharmaceuticals, private enterprises, emergency power solutions, food and water supply, basic economic transactions, cyber security and psychological defense,” per the commission. And part of it will be spent on training to resist propaganda efforts and fake news spread via social media. That latter point is something von Sydow said was important because part of the commission’s requirement is not just to defend the homeland, but to defend the democratic principles that are vital to the nation. “Ultimately the protection of democracy and political process is viewed as a core national interest,” said Erik Brattberg with the Carnegie Endowment for International Peace. “That is part of defense and total defense. It’s not just about making sure people have electricity and food. It’s also about making sure societal values, principles and norms” exist. A potential complication is the upcoming September general elections in Sweden, which could reshape the ruling coalition that has thrown its support behind the concept. However, von Sydow expressed his belief that enough parties back moving forward with the commission’s work, so whichever party ends up on top will not look to undo the commission’s progress. Early in the process, the commission seized on two key principals: that it would take Sweden’s military a week to be fully mobilized, and that it would take three months before allied ground forces would be able to arrive in force to assist Sweden in reclaiming its territory. On the first point, von Sydow said it is a simple reality that to mobilize the entire nation would take time. For that week, civilians would have to fend for themselves as best they can — something he described as having been calmly received by the Swedish public. The second point is perhaps more controversial, in that it’s based not on policy but on a mix of historic studies and conversations with allies. Because Sweden is not part of NATO, any military action would have to come from a coalition of willing allies. Sweden is planning to boost military spending by 11 percent over five years as tensions rise with Russia, and it sees the U.S. as a key partner, a top Swedish defense official said Wednesday. And while friends to Sweden may respond with air power or nonmilitary actions such as sanctions, getting a military force on the ground to retake territory claimed by Russia would take time. That is especially complicated if one assumes a military intervention in Sweden would likely occur with Russia pushing into several other nations at the same time, creating a crisis across Europe. “It was made clear, even more clear for us, exposed by sources I do not want to tell you about, that basically it would be within the scope of NATO or NATO countries; they would take at least this time to deploy contributions,” von Sydow said, adding the commission has briefed several allied nations, as well as NATO proper. Nordenman thinks both time frames are accurate reads on the situation, pointing out that citizens in the U.S. have had to fend for themselves for a week or more following natural disasters. As to the three-month gap, he calls it “not a bad assumption to use,” largely due to broad concerns about how slowly a NATO-based coalition can spin into action. “There is growing recognition, even in NATO circles, that under current arrangements, it will be a while before we’re in a position to defend anyone in northern Europe,” Nordernman said. Brattberg sees a silver lining to the commissions’ three-month conclusion: that Sweden does expect assistance to come eventually, even if it takes time. He points to a series of recent bilateral agreements between Sweden and other nations, including the U.S. and Finland, as perhaps fueling that. Finland in particular provides a unique viewpoint, as it, too, has a total defense plan. But unlike Sweden, it never dismantled that plan after the Cold War. In a recent interview, Finnish Defence Policy Director-General Janne Kuusela told Defense News he wouldn’t put a similar timeline for when aid might come, but acknowledged that his country has to plan to take care of itself in case of an invasion. Ultimately, the goal of the Swedish commission is to get to that point, as well, but the question of time is now a factor. The commission’s plans call for Sweden’s total defense concept to be up and running by 2025, a long time given how quickly geopolitics have shifted in recent years. Updated 3/16/2018 with additional information from the commission.